‘Kitchen experiment’ posts are where I totally risk time, money and energy trying to concoct something I’ve never tried before. Sometimes they work out great. Other times, it goes straight to the trash – or it gets hidden in the fridge until it becomes a health hazard and can be thrown away without guilt – or at least not as much. I bought a cabbage – mainly because it is a cheap and nutritious vegetable – without having a clue as to what to do with it. A search of the Internet led me to this recipe. Those of you unfortunate enough to have seen my veggie burger recipe will recognize that the onions and squash were leftovers from that. The diced tomatoes were what I happened to find in the cupboard. I had happened to shred the cabbage the other night, in anticipation I’d find something to do with it. As I did it, my daughter politely asked: does the mandoline really do anything a knife can’t? Well, she was right with the cabbage – I could have used the knife and pretty much used the same time and energy. I put the cabbage in the pot, then the tomatoes, then realized my first mistake: I should have put the tomatoes on the bottom. My understanding is that crockpots only apply the heat at the bottom, and without liquid or something else that will transfer the heat, it won’t cook properly. Shredded cabbage is practically insulation with all the air pockets. So I added the cup of water to help the cooking process – I would have left it out otherwise. About 6 hours later I tried the stuff. It was not particularly ‘soupy’ at all, and I could have actually added more water. The cabbage was still a bit hard, so I let it cook another 2 hours. At the 8-hour mark, the cabbage was very tender. The flavor of this concoction however, with just salt and pepper, was definitely missing something. It was a bit sour – probably from the tomatoes, which contained no seasonings at all. Looking around, I found an open packet of Trader Joe’s Taco Seasoning Mix and sprinkled just a bit on top. My-oh-my – that was quite an improvement! I ended up having at least 3 or 4 small bowls of the stuff. Great for a snowy day in the Northeast US. The one aspect of this recipe that caused some family disharmony was in the digesting of the soup. Let’s just say there was some sound and fury that was probably directly attributable to this stuff. I don’t recommend eating it without Beano, or right before a job interview. I’ve made something like this before and my family really enjoyed these – they are moister than a regular hamburger and certainly larger due to the enormous amount of vegetables stuffed into them. Here’s how we made them last night. All of the above was mixed together in a bowl then formed into 6 patties. I was afraid to try and fry them because while the egg helps to keep all the ingredients together, I’ve had problems flipping them without breaking, so they went into a 400 degree oven for 30-40 minutes. When done, the internal temp was around 160 and the tops were just a little bit browned. As these came out most awesome, I will certainly make them again – and as the kid likes to help (aka ‘slave labor’), I’ll hit her up to do the messy mixing work. I whipped this up a couple of times in order to find yet another way to enjoy kale. Even the kids eat this one. Melt the butter in a large fry pan, put in the onions, give them a minute or 2 to cook, then put the unfrozen vegetables in the pan. Cook for about 10 minutes or so on high, then at the finish, put in the cream cheese and mix it in – then season to taste. The cream cheese works quite nice to create a creamed spinach-like dish and the spinach seems to mellow the bitterness that kale sometimes has. Empathy for fat folks is in short supply – we’re all lazy and should just push ourselves away from the table and put down the friggin fork – right? Yeah – right. I wish it was that easy. It’s what a lot of fit folks think – because they never were fat. Well, here’s a fellow who – perhaps just to make a buck – decided to purposely stop exercising and watching his diet and porked up to 264 – 70 lb. increase. My goal is to inspire people to get fit, teach them how to do it and give them hope that it IS possible to get fit and stay fit. I want to share my comprehensive fitness knowledge with my followers so that they can know how to lose weight successfully, even though for many it’s going to be a struggle. People that are overweight have to overcome both physical and emotional barriers when it comes to losing weight. I hope to have a better understanding of this through my experience over the next year. Also, I hope to better gain an understanding of how hard it really is to be overweight. I know it’s only going to be for 6 months, but at least it’ll give me a small window of the physical and emotional issues that come with being overweight. I gotta give him credit. In a world that these days seems to possess little empathy for anyone else, here’s a guy who thinks that empathy might allow him to learn something. Extra credit for him if he’s figured out a way to make a buck off of empathy. If we can teach more people how to do that – there’d be a lot more of it in the world. I use a program called WeightBot on my iPhone to track my weight. Being lazy and/or stupid, I didn’t know that I could produce these nifty yearly charts – it always showed the data month-by-month. They make a nice comparison between 2010 and 2011 – don’t they? 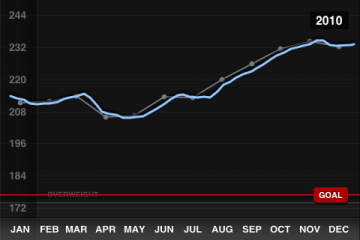 Obviously, 2011 isn’t over yet, and Weightbot draws a very optimistic projection (the dotted line) that I’ll be in my 180s by the end of the year – which I don’t believe. So what explains the big difference between the 2 years? If I was to narrow it down to just one thing, I’d say: mindset. I think that I had an epiphany of sorts in August of 2010 as chronicled in the post ‘The Rules Take Me Somewhere Unexpected‘ and further detailed in ‘The Continuing Saga of My Throwing a Bolt‘. These posts attempt to detail my awakening to the fact that the pursuit of weight loss had turned into a form of violence against myself. I stopped doing this – and I gained weight. I’m glad I did so, however – as counterintuitive as that seems. I think I needed to learn something in that – a tempering of the goals of weight loss so that it didn’t crowd out life itself. 2011 has been a year where I have learned to incorporate more carbs – fun carbs – junk carbs – into my diet – and still lose weight. It’s not a lot of carbs, but it’s enough to enjoy my life, to have pizza on occasion, to enjoy a meal with carbs, and not struggle as much. 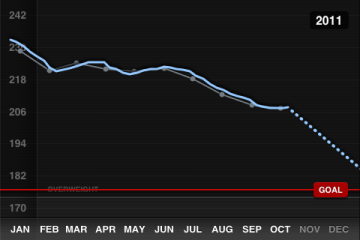 The weight does not come off as fast, but I’m more relaxed and it seems much more sustainable. Now…the year isn’t over yet. I could still mess things up. I’m not claiming I’ve got this licked or figured out at all. It’s an experiment – part of an experiment that I’ve been running on myself for 8 years now. It’s become more than just weight loss. Let’s say you’ve finally decided that you want to mend your ways and give up a sedentary life of wanton Scooter Pies and MaryJane abuse. You want to get healthy and take off all those extra pounds. Great – glad you’re here. Please note that the following is NOT for folks who’ve put on 5-10 extra pounds and want to peel that off. This is for the folks who, due to years and years of bad eating and bad living (that might have been quite fun along the way), have porked up way above what any person should be carrying around – 40, 50, maybe 100 pounds or more. Now, you’re reading this because you are looking for a way to start. Some trick to get you going and start that weight loss going. I won’t disappoint you. Here’s a trick. There – I said it. I have now turned off legions of joggers, spinners, lifters and fitness junkies that will probably call me lazy AND stupid – among a lot of other things. I’m imagining this post for the folks who’ve spent 20 years being fat and not exercising. Jeez – you have problems getting out of a chair…and the exercise junkies want you to exercise? Go on a diet first. I’m a low-carb person myself, but I understand people are different and there are a lot of ways to lose weight. The one common thread of low carb and low-calorie that I think neither camp would disagree with is: cut the crap. Ditch the cookies, ditch the fries, the chips, the ice cream – and anything that comes in a box with a list of chemicals a mile long. Don’t be tricked by calorie counts on the packages or the word ‘healthy’ on the label. Avoid them like the plague. Cut down on the processed foods as much as possible. Eat fresh vegetables – or frozen. Look for ingredient labels that only have ingredients you can pronounce drunk. Don’t be afraid of meat – buy the freshest and best quality you can find and afford. Steer clear of processed meats as much as possible. Learn to eat simpler. Don’t live on anything that gets cooked in a plastic tray in a microwave. Learn to cook a little bit. You’re not trying to be a chef, just experiment with simple stuff – there’s plenty of recipes on the Internet. I don’t want to trivialize this step – it is going to be AWFUL at first. A decades’ long diet of crap food is as addictive as crack cocaine. All this healthy stuff is not going to make your crack cocaine-level addiction to food happy at all. You are going to be cranky and miserable for at least a few weeks – and that’s why I think you shouldn’t even TRY to exercise. If you don’t exercise and don’t like it, don’t think it is a necessity at first. In fact, given the misery you are going to go through going cold turkey on the Snickers bars and Big Macs, why add injury to insult by stretching you ability to cope by exercising? Focus on the diet first. Give it time to become ingrained. Get over the cold turkey. You’ll begin to feel better when you eat better and take better care of yourself. Try different diet approaches and find out what works for you. Lose some weight. I guarantee: when you’ve got yourself feeling better and lighter, you are going to WANT to exercise. It will come naturally, when you are ready for it. You might have read the story that states vitamins do nothing – in fact, they might reduce lifespan – at least in the older woman in the study. Here’s one link to the story – it’s not hard to find more. The new reports speculated on the doses of some of the vitamins being too high and having untoward consequences. Supplements, as well as cheap processed food that touts its health benefits, can trick us into eating poor quality food because of a focus solely on the ‘nutrients’. Hey, let’s eat like crap then take a pill! Or this prepackaged, chemical-laden, overly processed food-like product has vitamin C – it says so on the label – it must be good! It’s been maybe 6 months since I’ve attempted to get my nutrition from pills, and I am more careful about what I eat. For instance, I try to get my Omega-3 through high-quality canned tuna that minimally processes the fish to leave most of the Omega-3 in the can, or sardines. While not the biggest fan of sardines, I found a good one I like a lot and have it at least a couple of times a week. Everything you put in your body has behind it a ‘chain of trust’. This chain consists of everyone who touches it before it goes down your throat. Being a bit on the paranoid side myself, I believe the best way to be sure I am getting what I think I’m getting is to make that chain of trust as short as possible. When I go to my farmer’s market, I can talk to the farmers. In this world, it is less likely that you will be screwed by someone who you talk to regularly – it’s so much easier to screw over people at a distance – you don’t feel as bad when your victim is faceless. I have to establish trust in this relationship when the farmer tells me that his eggs and squash are organic, but if it isn’t, he’s a sociopath that is lying to my face. Possible, but statistically unlikely. If I buy my eggs at Whole Foods, that chain of trust gets a lot longer. The vegetables and eggs are raised by faceless farmers far away, they are trucked a great distance to warehouses, then distributed to stores. Along the way, someone sticks a sticker on the squash that says ‘organic’ or puts the eggs in a package that states that. There are many more opportunities for sociopaths to stick that organic label on conventional foods and double my price while hitting me with a dose of pesticides I didn’t know were there. Yes – I’m sure the store has safeguards in place to prevent someone from labeling conventional veggies as organic. And I’m sure they work – most of the time. Take it to the next level and you have a processed product in a box – or a supplement. Look at the label with its 50 or more ingredients. A good percentage of them sat in shipping containers as powders or liquids, having been produced at scores of different factories, they themselves sometimes the product of a long chain of processes and people. Along the way, you just need one sociopath to add one ingredient that appears to be one thing but actually is another, and now you not only don’t know what you’re ingesting, you don’t know if it will harm you long-term or even short-term. The chances that the farmer I get my food from is a sociopath is small, but is, statistically possible. The chances that there is one sociopath somewhere in the chain of trust that provides me my supplements (or my processed food)? It’s statistically higher. Here’s the pharmacist who replaced expensive cancer drugs with water. Here’s the judge who put kids in prison because he made money off of it. Here’s the people who added an industrial waste product to baby formula and killed kids for a buck. My personal feeling on vitamins is that they might be good for you, despite the research, but I can’t be sure they are what they say they are because, as you would probably agree, there’s a lot of sociopaths out there.